Gor Mahia have received applications from a number of coaches including coaches who have been in Kenya. The tactician who has seemingly taken the lead in the race to replace Ze Maria appears to be Frenchman Didier Gomes Da Rosa. According to goal.com, the club has offered him a monthly salary of Ksh 500,000. According to the source, the coach has plenty of experience working all over Africa. “Da Rosa is a good coach and it is not a problem for him to work in Kenya since he has already worked in Rwanda with Rayon Sports…in Cameroon with Cotton Sports and Algeria for Constantine where he was fired and since that he is in the second division league in Algeria.” he said. 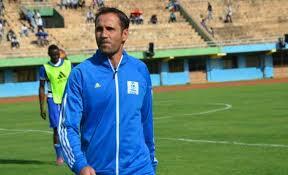 He was in charge of Rayon Sport when they last won the Rwanda league in 2013. He resigned in 2014. He then joined Coton Sport of Cameroon. There again he won two league titles 2014 and 2015). He also won the Cameroon cup and steered Coton Sport to the semi-finals of the CAF Confederations cup. He then left for CS Constantine of Algeria. There again he was in the thick of things sending his team into the second round of the CAF Confederations cup. His contract with CS Constantine was recently terminated by mutual agreement. Argentinian Rodolfo Zapata is another coach who is considered to be in the running for the position. He is currently with Gaborone United of Botswana and has been in the midst of negotiating a new contract. Zapata is known for developing young players. Other coaches who have shown interest according to the Nation are former AFC coach Luc Eyamel, former Kogalo coach Zdravko Logarusic and former Zambia coach George Lwandamina. Eyamel has extensive experience all over Africa where he has coached several top teams. In 2010 he coached AS Vita club (popularly known as Mokonzi Ya Terrain) to the Congo DR league title. He also coached in Rwanda, Sudan, Kenya, Algeria and most recently with Polokwane City in South Africa. George Lwandamina won the league and cup double with Zesco United in 2014 and was twice voted Zambia coach of the year. I agree coz Lwandamina can also tap into the rich talent base in Zambia & even TZ. 500k salary may be an issue though, its more than he was getting at Zesco but way below his pay at Yanga. Next is Da Rosa but why is he in Algeria “nationwide” league, can he communicate in the “Queen’s language”. Sadly, the rush to get a head coach even by the EC does not augur well for Zico. Why is he being tagged along if there’s no iota of confidence in his abilities. Lastly to Ngesto & Kazzarah, if Mugabe cannot ensure (and has never managed), with or without sponsorship, that agreed players/TB salaries & allowances are paid on time then how does he expect GMFC to win titles. Will he & bloated EC take to the pitch & play? Maybe that’s why he expanded EC to 11 positions/persons. He must put in structures that ensure that the agreed players welfare is adhered to. Lest you forgot severally it has been reported that “MUGABE RUSHED TO THE STADIUM TO PAY PLAYERS ON A GO SLOW” PROOF THAT AR IS THE PROBLEM IN GMFC. Either the Frenchman because of his track record or the Argentine owing to his youth development credential. Zico till December! That’s my sure bet….. Yes. From Maria to Rosa meanwhile Maureen is no more. The Frenchman may be the best candidate at least on paper. Lwandamina may be a good bet but with George Bwana’s ties to his former Zesco and Gor Mahia he may end up being another foreign ‘jadala” ( Excuse my usage of the word as I don’t subscribe to it but it helps drive my point home in this instance). Zico has already polarised the Gor Mahia nation to an extent that no good is going to come with him at the helm even if it ordinarily would have. And why are we signing another central defender with Joash signed in January and not having played much? Plus Calabar Junior!!! Is he one of those cases who is going to warm the bench then get released in December a la Gradus, Okinda, Murai et al? I politely beg to differ, Lwandamina coached Zesco to CAF Champions league final (more recently than even Rosa), he was even the interim coach of the Chipolopolos and he signed our very best,yes even though through Bwana, “King David” and Akumu “Ber”. The man oozes pedigree not the kind of person to be influenced/ control by Bwana or maybe even EC. To Loga, a coach i admire apart from his empty boasts and chiding of our beloved GMFC when he took over efusi, I remind of the “Chinese proverb-“MAN WHO SCRATCH ASSH**LE SHOULD NOT BITE FINGERNAILS”. Secondly he and Eymael are addicted journeymen. Maqbul has never featured yet…..Hehehe. Why didn’t we sign this defender 6 months ago, when he was still unattached? Ah! Of course money has to change hands and when it does some is blown by strong winds directly into the pockets of those doing the transaction. Somebody just sign for us at least one striker even if he is a school boy wonder kid. Osiepna, Gor Mahia and Mugabe have “HUGE DEBTS” please understand. Jakom made this very clear to members when seeking re-election. Wuod Kanyada, i may tell you this in some crude terms but i hope the message gets there. Since i have followed for some time , i am convinced you have the club’s interest at heart. Why don’t you use some unorthodox style to achieve our goal and be at the technical bench? Even if it means bribing or securing a commission to the powers that be, I’d be glad to have you there. We can only make a change from inside not screaming from out. Who knew that Nyangi would become the “takataka” she is today up there? We need people with acumen, with club at heart like you. Let us starategize on this. Sasa maneno ya Dagi Rosa, pat pat ,lwanda minwa, Longarusi na mengineo, tunawachia experts. Over to you Jasego and others. Sisi Ni experts kwa noise making. But as long as Mugabe’s is hell bent on mismanaging the club, even if Antonio Conte became the coach, nothing would change. Will “Jodala” mania let any of those coaches work?A few games into their contract and the “luo” in us will demand the presence of Pamzo and Jerry on Gor TB.Truth be said my Luo friends:The person you see in the mirror every morning before you leave the house is your worst enemy.We have pressed the self destruct button and we are going downhill.Before casting aspersions at Ze Maria,the playing unit,TB and EC let all do honest self assessment. We shall discover that it all started with us.For stability I submit that Zeddy be given a two year contract and be given enough cash and freedom to manage the team.Should he fail then we may have a legitimate reason to hire a non Jodala. Jodala,as I have read on numerous posts here,are very successful coaches.Let us give Zeddy the benefit of the doubt.Let’s be patient with him as a Jodala. This will pacify some egos here and hence a win win situation. Sportpesa to withdraw all sporting sponsorships starting January 1, 2018. The EC should begin engaging alternatives since sufficient notice has been given. Musymo is that decision effective only in Kenya due to the recent tax proposal or across all the nations including Tanzania (Yanga and Simba) and UK where Everton and Hull City are beneficiaries too? Only in Kenya. This is also an option for the other companies (including other betting companies) to come fill the void. I feel there is an issue of blackmail from Sportpesa. Owadwa i dare ask, with the impending SportPesa conmanship and lack of good faith sponsorship pullout, are there no legal ramifications that we can pursue to get lumpsome payments from them. Didn’t they hold our throats on stranglehold saying we have to behave in a certain way at all times and even accept injustice like point deductions without protest and we abided in order to keep getting money?How is it then that they can pullout so easily i mean didn’t reputable lawyers like our own Almighty Mzee, Muthomi of FkF, Richard Omwela for Kenya Rugby Union etc contemplate such eventualities and put in safeguards on the contract agains’t such or excitement of ”Pesa Odonjo” it is our time to Eat took center stage throwing all Due Diligence to the wind? ” We ate with them, we cannot accuse them. We atea piece of the cake( commission). We are equally guilty and the skeletons in the cupboard will spring out’. Gor Mahia are signing too many players. These are poor signings. I mean we have too many players already and we are still adding more. Why buy a defender and we already have Bernard younger brother to Calabar. Its not funny anymore. Why do we sign a rookie winger from Nzoia and we already have a wide array of wingers in Gor. Others haven’t even played much. Maloba, Softie, Walusimbi, berry, wafula, Nondi e.t.c. Where will all these players play. We need to sell the likes of Simiyu, Maqbul, Jeconiah Uyoga who didn’t even play in the sportpesa super cup let alone the league. Let’s be logical here atleast. GOMA LOTTO should take advantage of the void/niche created if SP decide to pull out of the market altogether. The extra revenue earned can more than adequately sponsor GMFC. Only problem is EC’s insatiable greed. Can Mugabe just this once put in place structures at GMFC & GOMA LOTTO to reap maximum benefits should such an eventuality come to pass. I have always had my reservations about this Spotchietha sponsorship. They have expanded their profit margins hence they are now “carrying their buttocks” around. The probem is that Mugabe cannot think beyond his nose to stabilize the club. Comrades i pose the Question, with the impending SportPesa lack of good faith and sponsorship pullout, are there no legal ramifications that we can pursue to get lumpsome payments from them. Didn’t they hold our throats on stranglehold saying we have to behave in a certain way at all times and even accept injustice like point deductions without protest and we abided in order to keep getting money?How is it then that they can pullout so easily i mean didn’t reputable lawyers like our own Almighty Mzee, Muthomi of FkF, Richard Omwela for Kenya Rugby Union etc contemplate such eventualities and put in safeguards on the contract agains’t such or excitement of ”Pesa Odonjo” it is our time to Eat took center stage throwing all Due Diligence to the wind? We ate with them, we cannot accuse them. We atea piece of the cake( commission). We are equally guilty and the skeletons in the cupboard will spring out’. You forget that deals were made privately? and some people ate?